Hakonechloa (hah-koe-neh-kloe-uh), Japanese Forest Grass, Hakone grass; Poaceae Family. Native to Japan, Hakonechloa is most at home in shaded, woodland environments where the soil is rich and loamy. 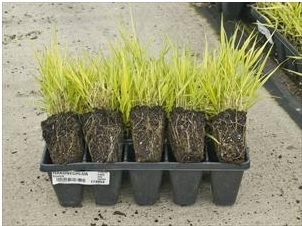 Hakonechloa will not grow in poorly drained soil, heavy clay, or very dry soils. Part to full shade is best; full hot sun tends to scorch the leaves. Hakonechloas are very salt sensitive plants. Since it is such a slow grower, Hakonechloa will not be necessary to divide this for many years. However, division is easily accomplished and may be done in spring or fall. In zones 5 and 6, mulch it with fall leaves to a depth of about 2 feet and cover the pile with branches to keep the mulch in place. In southern zones, this mulch is not necessary. In early spring, remove the leaves and cut back last year's foliage to allow room for the new growth. Attributes: Border plants, Containers, Edging, Mass Planting, Specimen or focal point plant, Deer resistant.